A classic activity with an eco-friendly twist! 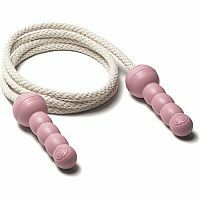 Hop, skip, and jump the day away with this Pink Jump Rope from Green Toys, which feature 6 foot long, adjustable cotton ropes and recycled plastic handles. What better way to hop all over this great Earth than with an Earth-friendly jump rope? Measures approximately: 72.00 x 1.50 x 1.50 inches..